A little too Tokyo for Texas. 'll admit, I had no idea what to expect when I popped in Roogoo: Twisted Towers for the first time. Dismissing that I've been told it's "puzzler of sorts," I entered into the world of Roogoo completely blind. Considering this, Roogoo was so kind as to recommend that I partake in the tutorial in order to familiarize myself with what was in store. This recommendation was more of a stonewall. None shall pass through the story mode without having first completed the tutorial. This point is stressed only due to the menial gameplay that followed. as any: blocks and holes.I'm certain most everyone is familiar with the very basic children's games that best describe the basics of the Roogoo universe: individually shaped baby blocks that must pass through the corresponding holes in a ball-shaped toy. 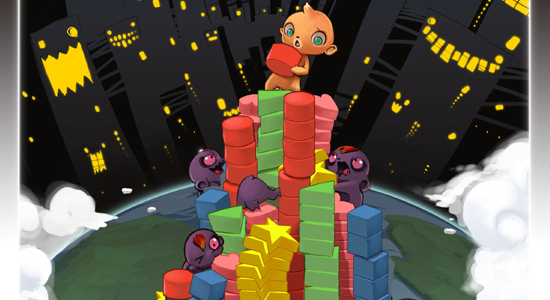 In Twisted Towers, the concept is the same but the blocks fall from the sky toward platforms that the player rotates to match the holes to the blocks. Visualizing this explanation might leave you wondering why Roogoo isn't a series branded specifically for a children's gaming system like the Leapster ( can you tell I'm a father?). For the first hour of play, I'd be hard pressed to find a reason not to be so dismissive. The tutorial is very simple and would be perfect for a young child just becoming familiar with shapes. Roogoo: Twisted Towers isn't meant for a child, however. I can only imagine the controls would be too difficult for any child to whom it would be beneficial. This very basic game takes a sharp turn in difficulty around 24 levels in. No longer a mind-numbing bore, yet never any more elaborate in its tasks, only further stressed with gameplay additions. Multitasking is introduced as you are ordered to rotate platforms and catch bats or butterflies at the same time, with the motion controls. This feels more like a virtual adaptation of the pat head/rub belly diversion than a dynamic gameplay element. The speed with which blocks fall increases as you play — an expected and welcome element in any puzzler. Instead of falling directly downward, pieces begin to move three-dimensionally to the next platforms. While this concept might sound interesting, it becomes bothersome as judging the block locations on the already 3D platforms is difficult. Furthermore, the implementation of the 3D movement obscures the screen at times, so much so that the screen becomes completely obstructed by passing blocks. Roogoo multitasking.Not until the first boss fight (around the 20th level) did I encounter any compelling gameplay. These encounters seem to change the game just enough to make the entire package fun, a forgotten element prior to that point. The change was simple: instead of juggling elements of the gameplay you quickly jump between them in rapid succession. Further boss fights even become rather comical, as a giant sea creature laughs maniacally while turning platforms like a bus driver does a steering wheel. With the exception of boss fights, further play never seems to make this well-needed change. Multiplayer versus has potential for enjoyable play. While adding another element to the otherwise coma-inducing levels, the learning curve of the game makes pick-up-and-play very difficult. After some play, I'd felt a little Roogoo research was in order. Previous iterations of the franchise have been well-received, a fact that has perplexed me while going through the motions with Twisted Towers. Most importantly, I do not know how much of a departure this game has taken from those prior. The Wii controls might not lend themselves to the game as well as the Xbox 360 does.